Continuing the public transport theme of the last posting, here are two lovely period shots of local buses. 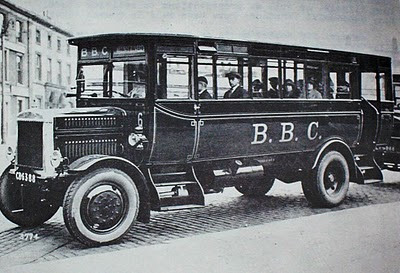 The top photo is of a 1926 Leyland ''G'' Type and the lower photo of a 1929 Leyland Titan TD1. The bottom photo was taken on Shear Brow, just lower down than Park Ave and Stedd Terrace / Wimberley Street. The little children are stood at the gate to No 36 Shearbrow. I lived with my family at No 24 Shear Brow, just 5 houses further down, from 1967 to approximately 1978-79. When I was going to school from there, all the way to North Rd near Shadsworth, I could have done with that bus stopping outside our house. That section of Shear Brow, from London Rd up to Eldon Rd, is the steepest part of the brow. Difficult to imagine a Double Deck bus, filled with passengers, climbing that hill. But the destination 'roll' on the front above the cab, clearly says 'Shear Brow'. Perhaps they climbed via a different route, then descended via the brow. Pretty brave driver and passengers in winter time. Not too sure where the top photo was taken, possibly on Blakeymoor? 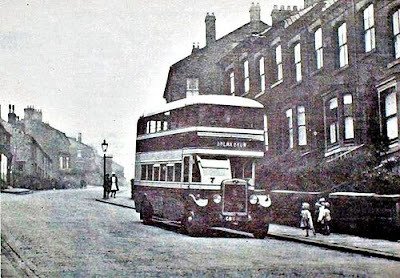 BOTH PHOTOGRAPHS COURTESY OF BLACKBURN BOROUGH TRANSPORT DEPARTMENT.